"Finally! A simplecourse about Gain Staging that’s intuitive and thorough"
Let me ask a question: Could you record better if you truly understood some of the basics to this art and science of engineering? What if you had a solid knowledge of exactly what you needed to know? No fluff. No expensive words. A course that made you confident that you know what you NEED to know about. "When are you going to create a course on Gain Staging?" ... It's a question I get almost daily. Well, I wanted to take my time and make sure that I boiled it down to the basics of Gain Staging. Personally, I find comfort in knowing that everything (including gain-staging) has an 80/20 rule. In a nutshell, you don't have to have 100% of the information to get 100% of the results. As a matter of fact, if you did that, you'd waste precious time learning things that you'd likely NEVER EVER USE. I believe (and it's pretty much backed up by science-dudes much smarter than me) that you really only need to know 20% of information on a subject to get 80% of the content. In other words, you don't need to know everything ... that's ok. In fact, stopping and doing a full-on study on gain staging would would actually stop you (or at least delay you) from doing what it is you love... recording. 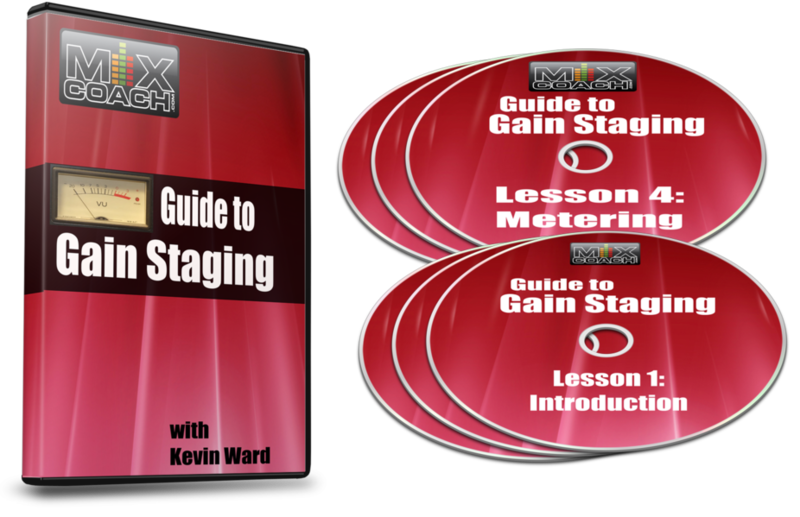 In this Gain Staging course, I'm going to show you the stuff that the "forum guys" will try to convince you that's important. The bottom line is usually that they want to sound smarter than they are. I want you to totally understand the basics of gain staging. I can teach you in a short amount of time what's important when it comes to setting up a channel correctly to get the most optimum sound. Your client is happy and you will be happy too. Have you ever been mixing or recording only to discover that in the heat of the moment, some distortion happened and you don't know exactly when it did? Now you are stuck with a sub-par representation... and it kinda makes you look bad? But you don't even know what you did wrong; so you can't predict if it will ever happen again. Do you just want to understand in a non-geeky way, how to set up your mic pre to get the level to your DAW where you can listen to the performance? and stop worrying if you think you heard something. But, instead move forward with confidence that your mic, your pre, your compressors and your output are set up properly? Have you ever slammed a signal to a compressor not knowing if the meter should be moving that much? "Well, that's the preset I called up for vocals... that must be right... right?" Becoming a good recording engineer comes from years of experience.. experience is simply having made the wrong decision enough times to know what to do about it. The good news is, you don't have to go through all those "wrong decisions' yourself. You can learn from other engineer's mistakes... (that is if they are even willing to tell you what those mistakes were)... I've made those mistakes... and I want to share what I know about it so YOU don't have to make them yourself. The reason I'm putting this course together is that I feel an obligation... a call if you will... to teach anyone who wants to learn recording how they can get great results faster than they can on their own. Sure, you can do it on your own, but what fun is that? Plus, it would take longer. Gain staging is GROUND ZERO when it comes to getting a good sound. You can flip switches and twist knobs until you think it sounds good, but I find that I grow faster when I KNOW what a certain switch or knob should be doing and when I should be worried when it doesn't do anything. If you don't understand gain staging, you may get it right some of the time, but you won't develop confidence in what you are doing... even a broken clock is right twice a day. don't be a broken clock. Learn Gain staging from me. Lesson 5-7 – A walk through every stage of ‘gain staging’ … Direct Boxes, Microphones, Singers and Amps, oh my! You know me… if you don’t let me tell you though (for those who don’t.) I’m more interested in you knowing gain staging and understanding what you need to know about it more than I am any monetary gain, so if you don’t like the course, find that you knew the information already, find that you didn’t like my teaching or don’t thing it’s relevant tot making you a better engineer by understanding how it works, all you need to do is let me know and I will gladly refund 100% of your investment. I’m that way, sure, I may ask you how I can explain it better, but I’ll refund your money. I've already recieved compliments on my productions. Needless to say, MixCoach has been an invaluable asset. Thank you Kevin and the rest of the MixCoach Team! Thank you Kevin, you are a great teacher, i already know the Basics of Mixing and Recording, and from you I have learned as much as the old teacher had! This is rare today! Since I want this course to be comprehensive and REALLY make you comfortable with gain staging, I want to offer a question and answer tele-seminar. The first responders to this course will not only get the course and everything we add to it over time, but we will notify you of a special “ask any question” tele-seminar that we will schedule shortly after the launch of this product. You’ll have a choice to simply email your question in and we’ll answer it on the tele-seminar, OR you can show up and ask the question live. We will only be offering this live Q&A for the early responders to this course.